Myself (Stan Deutsch) and a classmate (Norman Levine) were both delighted to discover and browse your Kew Gardens website. We have come across the enclosed graduation photo which we would like to share with all interested and would be delighted to hear from any and all former classmates. 2nd row: Robert Kessler, William Baitinger, Bruce Anderson, Donald Topalian, Hans Hamburger, William Bondi, Stanley Deutsch, Karl Kohler, Ernest Dahl, Richard Weinman (? ), ____ ____. 3rd row: Joel Kaplowitz, Steven Seemons, Barbara Whitman, Claire Weiss, ____ ____, ____ ____, Diana D'Arienzo, Eleanor Warshaw, Stanley Muroff, Norman Levine. I trust this information will provide some pleasant memories for all involved. I should mention that both myself and Norman recently took a tour of Kew Gardens for the first time in many, many (40 or so) years and the old adage "you can't go home" does indeed apply. The quaint village of our childhood now exists only in our memories and websites. 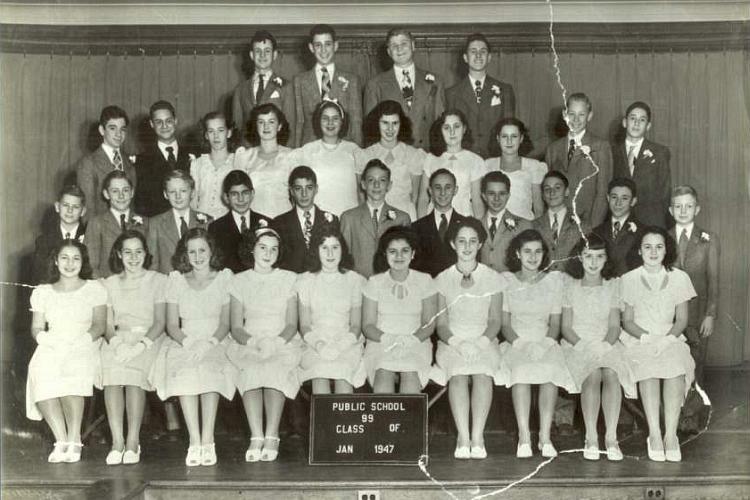 I should mention that Norman provided the graduation shot and he and I (Stan Deutsch) identified as many of our former classmates as we could.We would love to hear from any and all of you out there.